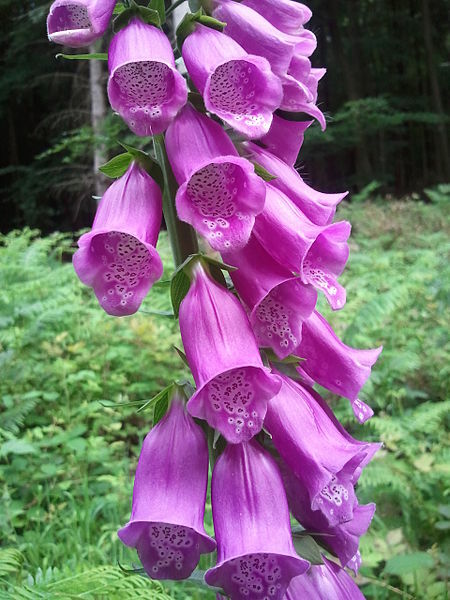 Digitalis purpurea, known commonly as foxglove, is a flowering plant native to most parts of Europe. It is the original source of the heart medicine digoxin, (also called digitalis or digitalin). Digitalis, during its homeopathic provings slowed the pulse rate of those who took it. As a result it is used homeopathically as a ‘similar’ to treat an abnormally slow heart beat. Allopathically, which treats by ‘opposites’, it is used as digoxin for fibrillation (when chambers of the heart beat rapidly). Mental-emotional symptoms that may also be present and indicate its homeopathic need are fear of death, remorse and guilty feelings, tearfulness, and aversion to talking. The liver and prostate gland may also be affected. When the remedy matches the symptom profile, Digitalis has the ability to treat conditions such as angina, arrhythmia, congestive cardiac failure, hepatitis, prostatitis, and rheumatic heart disease. Extremely slow, intermittent pulse; weak heart; or rapid, very irregular pulse. Respiration; irregular, difficult, slow, deep or performed by frequent deep sighs; sometimes stops on dropping off into sleep. Excessive jaundice, with slow, weak heart, and ashy-white stools. Faintness or sinking at the stomach; feels as if he would die if he moved. Blueness of skin, eyelids; lips, tongue; cyanosis. Distended veins on lids, ears, lips and tongue. Great anxiety and inclination to shed tears ; apprehension about the future. Indisposed to speak ; inclination to lassitude. Faintness and debility, with perspiration. Attacks of great debility, especially after breakfast and dinner. Prickling pain in the muscles of the upper and lower extremities. Dropsy of internal and external parts. Dulness of head as from inebriation, with increased mental activity. Overworked mind, pulse being weak. Lascivious fancies day and night. Internal anxiety, like from troubled conscience. Anxiety, with great fear for the future, worse at 6 P.M. Piercing pains in the joints. Distended veins on the eyes, ears, lips and tongue. Flabby, œdematous swelling all over ; with fluttering, weak pulse, cold legs. During the climacteric, sudden flushes of heat followed by great debility, irregular pulse ; least motion brings on palpitation.